Real people have real feelings. And since the characters of my new novel The Sweet Spot are real to me, I believe it applies to them. Actually, the novel is filled with emotion. Love. Joy. Humor. Grief. And then there’s the ugly stuff. Jealousy. Anger. Hate. Oh, there’s more than that certainly. But let me focus on Edie St. Claire, the novel’s main character. She’s a young widow who still grieves for her husband, Gil, who was killed in Vietnam eight years earlier. (The novel is set in 1978.) I don’t blame her. He was a sweetheart of a guy. I should know. I created him. They were high school sweethearts who married young. Gil was taken by Edie’s fun-loving spirit. She adored his tenderness. They would have had a wonderful future together, except he pulled a low number during the 1969 lottery and had to go to war. I’ve never been a widow. But the blessed part about being a writer and a person with a creative mind is that I can imagine it. When The Sweet Spot starts, Edie raises their young daughter by herself. She does her best, whether it’s helping her crusty old father or her fiery aunt who live next door. Still, she knows how to have a good time, whether its playing softball — the camaraderie and banter among her teammates are a lot of fun — or hanging out at the local watering hole, the Do-Si-Do Bar. These are simply ways for her to escape her grief. Then, there is her affair with her married brother-in-law, Walker, who could never replace his brother although he sure keeps trying. I can’t give away the rest of the book, but things turn out badly for Edie and Walker. Now Edie must deal with different emotions like shame, hatred and pride. How does she handle them? Let’s say I’m rooting for her. Want your copy of The Sweet Spot? It available on Amazon as a paperback or eBook. Here’s the link: The Sweet Spot on Amazon. If you enjoy the novel, I’d love a review. Thanks for your support. ABOUT THE PHOTO ABOVE: I’ve become hooked on making sourdough bread this winter. I was inspired by Michael Pollan’s book and documentary series Cooked. I follow his recipe, which takes two days as long as you have an active starter. The bread keeps getting better and better as I learn. Sort of like writing. 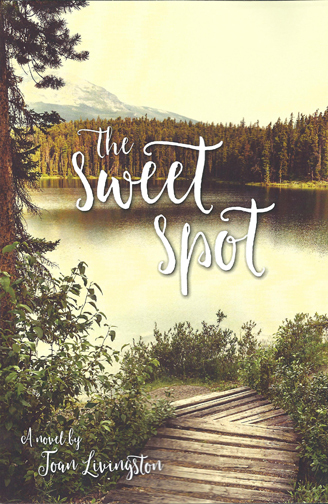 The Sweet Spot went live nine days ago, and I am grateful to those who have shown interest in my new novel. My own paperbacks arrived at the post office late last week. There’s something about a book in hand, especially one you’ve written. 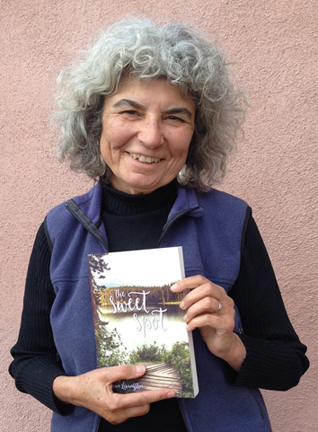 I’ve been visiting our local bookstores — yes, Taos still has them — to request they carry The Sweet Spot. Brodsky is delightfully jammed with used books and locally written books. He had the first signed copies of John Nichols’ My Heart Belongs to Nature. 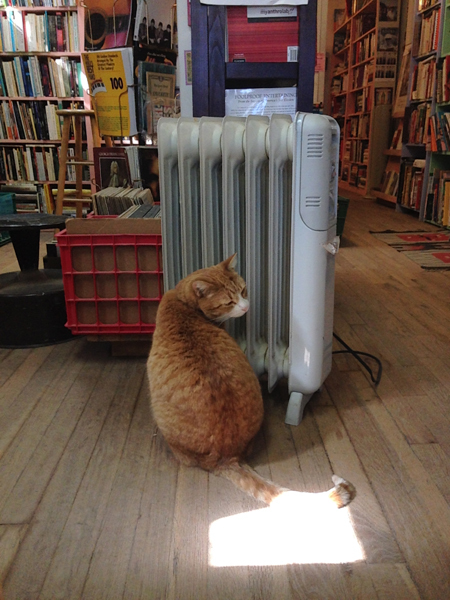 Of course, a visit to Brodsky is not complete without an exchange with its orange cat, Willy, named for the character Willy Loman. That day he was hugging the portable heater. Yes, that’s him above. My second visit was to Op. Cit. Books at the John Dunne Shops. Besides dropping off books, I arranged to have a reading Saturday, March 25 at 2 p.m. Thank you very much, Betty. I have a couple of more places to visit. And in the spirit of keeping things moving, today I finished the first draft of Isabel Long, a mystery I began this fall. This is my first stab at a mystery, and I will admit I enjoy the genre. Isabel Long weighs in at 73,000 words. Here is a very brief synopsis. Twenty-nine years ago, a woman went missing in her little town. Newly out of work as a newspaper editor, Isabel Long decides on her own to solve the mystery. (She also gets a part-time job at the local bar called the Rooster.) Yes, the setting is the hilltowns of Western Massachusetts. The characters are, well, interesting characters. It even took me a while to figure out who dunnit. So I quietly raise my mug of tea in hurrah and then plan to get back to the novel’s beginning. I have a ways to go before I finish this mystery. I am pleased that Kindle version is ranked at 1,715 in Literary Women’s Fiction. And if you enjoy the book, I would love a review. Thank you all. My novel The Sweet Spot is dedicated to my mother, Algerina. I have a good reason to single her out this way My mother, who will be 93 on April 2, inspired me with her love of reading. She has always been a big supporter of my writing. Naturally, she was surprised by the dedication. My mother’s also a humble person. My mother didn’t grow up with the educational advantages I had. She loved school and wanted to be a nurse, but that was during the Great Depression. She was the daughter of immigrants from Madeira. Her father pulled her out of school to work in the textile mills of New Bedford. She never realized that goal. When it came to reading, my mother was a great role model. 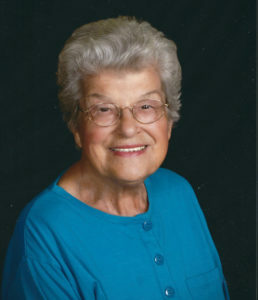 She took us once or twice a week to the Millicent Rogers Library in my hometown of Fairhaven, Massachusetts to stock up on books. During the summer, a bookmobile came to the church parking lot at the bottom of our street, and she would ask me to bring back a stack of books. Oh, one last thing, I have made her a character in the novel I am now writing — a mystery set in the hilltowns of Western Massachusetts. She moves in with her daughter and helps her solve the case of a missing woman. I bet she gets a kick out of it. Thanks, Mom, for your inspiration and your support. As of today, my new novel The Sweet Spot is available in paperback and Kindle. I hope you will read the first of my hilltown novels set in Western Massachusetts. Of course, that means I hope you will buy my novel in whatever format you prefer. Thank you if you do. Just like Edie St. Claire offers her new neighbor, Harlan Doyle, I toast the novel’s launch with a glass of well water that I’ve let run until it’s as cold as it is deep in the ground. Well, it is morning. Maybe later I’ll have a beer straight from the bottle. To set the mood, I choose Country and Western music, preferably pre-eight track with the likes of Patsy Cline and Hank Williams. For those new to my novel, here is a brief synopsis. It is set in 1978 by the way. Most in Conwell love Edie St. Claire, the widow of a soldier killed in Vietnam, until her affair with his married brother ends badly. She tries to survive this small town’s biggest scandal through the help of her rough-sawn family and a badly scarred man who’s arrived for his fresh start. It’s been a bit of a process bringing The Sweet Spot to readers. I wrote the first draft in 2004 while I was recuperating from being hit by a car. I was a pedestrian in a crosswalk. The guy claimed he didn’t see me. It took me less than two months to finish the draft. I was living in the hilltowns of Western Massachusetts, where the novel takes place. My then-agent wanted me to start the book in the middle, which I did, but he couldn’t sell it after all. The Sweet Spot remained unpublished for years. Once in a while I would give it a read until finally I decided to return to its original and rightful plot. Eventually, after I had moved to Northern New Mexico, I showed The Sweet Spot to my second agent, who gave me some solid advice about upping the dialogue, which is one of my strengths. There were other changes. The novel got better. Alas, he didn’t sell it either. So here I am doing it on my own, except for Michelle Guiterrez, the novel’s skilled designer. She came up with the cover and font after she read the novel. I believe it’s a classy-looking book. Thanks, Michelle. I have also had the encouragement of writer friends like Teresa Dovalpage and Fred Fullerton. Doing it on your own is tough. I should have kept track of how many times I read The Sweet Spot — forwards, out loud, and even backwards a few times. But it makes me feel good that I still enjoy reading the book. I love its characters, even its so-called bad guy. Edie. Walker. Gil. Harlan. Benny. Leona. Amber. The whole damn town of Conwell. They all came from my imagination but they are very real to me. I hope you feel the same. And if you do, I’d love a review. ABOUT THE PHOTO ABOVE: Hank shot that photo of me holding The Sweet Spot in our front yard. Yeah, I’m really that happy about it. Yesterday, I tweeted this to a friend: Family drama makes good fiction. Certainly, I believe that’s true for my novel, The Sweet Spot, set for a Feb. 20 launch. Especially, when it involves class. Edie St. Claire, the novel’s main character, is in the thick of this drama. She is a part of two families. The first is the one she has with her father, aunt, and young daughter — the Sweets. Then, there are her in-laws, the St. Claires. If you were to divide the fictional town of hilltown of Conwell into classes, the Sweets would be in the lowest. After all Edie’s father runs the town dump. They live in a modest duplex home on a back dirt road where Benny Sweet stores all the junk he hauls home from the dump. When Benny finds a kid’s bike, he spray paints it gold for his granddaughter. Her grandparents, the St. Claires, buy her a new one. Edie’s income comes from the government, because her young husband, Gil, died eight years earlier in Vietnam, and what she gets paid working at her in-laws’ store. Her in-laws, the St. Claires, are in the opposite class. Fred and Marie own the town’s only store and do well by it. They have a fine home. They are generous with their granddaughter. The St. Claires certainly were not happy their favored son, Gil, loved and married Edie. They made that very clear. It took a while, but Marie and especially Fred got over it. Of course, there is family drama when it comes to Walker, Gil’s married younger brother, who is having an affair with Edie. I am not going to say more about that, except when things turn ugly, high family drama comes to play. People are downright cruel. There’s other drama in the novel. I mentioned in the last post the good-natured rivalry between Benny Sweet and his sister Leona, the fiery, one. Of course, Harlan Doyle, the newcomer who moves next door to Edie, gets a ringside seat for all of it. Here’s a scene early on at the Memorial Day celebration the St. Claires hold at their house. Edie is there with her young daughter. Later, Edie gnawed on a chicken bone while Gil’s great-uncle napped beside her in his wheelchair. He had a smile on his sleeping face. Gil loved the man, and she was content watching him while she tried to build a buzz from the weak beer her in-laws bought. Marie took the chair next to hers. Her face was flushed. Edie closed her eyes briefly. She smiled at her mother-in-law. Women who didn’t drink for fun got so sloppy when they do to forget. She didn’t blame Marie. This was tough day for her. So was Gil’s birthday, Christmas, or any day that reminded her she was a mother to a good son who died young. Edie knew her mother-in-law wanted to talk about Gil. It wasn’t always this way between them. She remembered how much Fred and Marie disliked her when she and Gil went out in high school. Their Gil loved Benny Sweet’s daughter, the girl who used to go with her father when he worked at the town dump. They were too polite to say it directly to her, but Edie knew by their stiff comments and the way they checked the clothes she wore. Both wanted another girl to marry their son, someone who went to church and whose father had a respectable job. But it was behind them now. She only had to glance at Marie, and the woman began blubbering about Gil. She could finish her mother-in-law’s sentences. Gil didn’t deserve to die. He would have been a wonderful father to Amber. She was grateful Edie made him so happy. ABOUT THE IMAGE ABOVE: I bought this little treasure, a hand-made lace handkerchief, for $2 at a local thrift store. I can’t imagine the work that went into this piece. A labor of love, I am certain.